I saw your Christmas morning post and thought it was great. So I was hoping for some advice. I’m going to a holiday party and have to bring a dish. The problem is I am a guy with let’s say, limited cooking skills and materials, but I would still like to bring something that looks ( and tastes) good. Do you have any recommendations for me? To the above reader, thanks so much for your email, and for any further questions or ideas please email me at favorsandfestivities@gmail.com. I’ve noticed that for most of the potlucks dinners that I’ve attended, there is always a lot more desserts than actual meal items. As Christmas is the season of indulgence, I thought it wise to provide a recipe for an appetizer, along with a dessert. Both recipes are relatively inexpensive to create, simple, and absolutely delicious! I once made these for a New Year’s Eve party and because they were both refreshing and healthy everybody loved them! Wash and dry the cucumbers before cutting into them one inch segments. Using a melon baller, knife, or even a regular spoon, hollow out the cucumbers to form a small bowl. The middle part of the cucumber that contains the seeds should be relatively easy to remove, but be careful you don’t create a cucumber ‘ring’! It’s very important that you leave a thin layer of cucumber on the bottom as you don’t want your crème fraîche and salmon falling through. 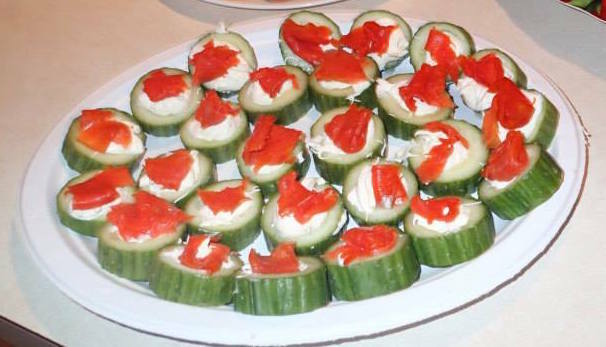 Place ~1/2 tbs of crème fraîche into each cucumber and top with an appropriately sized piece of salmon. Serve chilled. Optional: You may also top each cucumber salmon cup with a few capers, but as I detest capers I usually omit this step. So this S’mores Pops recipe is from Ali at Gimme Some Oven, but as I’m tempted to make them myself and they seem super easy, I’m recommending them. As you said that you have limited cooking materials, and most likely don’t have a double boiler, while you’re microwaving the chocolate, do it in 30 second increments, stirring in between. As for my own personal recommendation, you could also try coating the marshmallows in either chocolate graham crackers or roll them in crushed candy cane pieces for some festive cheer. If you’re not in the mood to head to a craft store for lollipop sticks, you can also use the wooden skewers that you would normally make shish-kabobs with. They’re often food in your local grocery store but make sure you skewer the marshmallows with the non-pointy ends! What’s your favorite holiday potluck recipe?